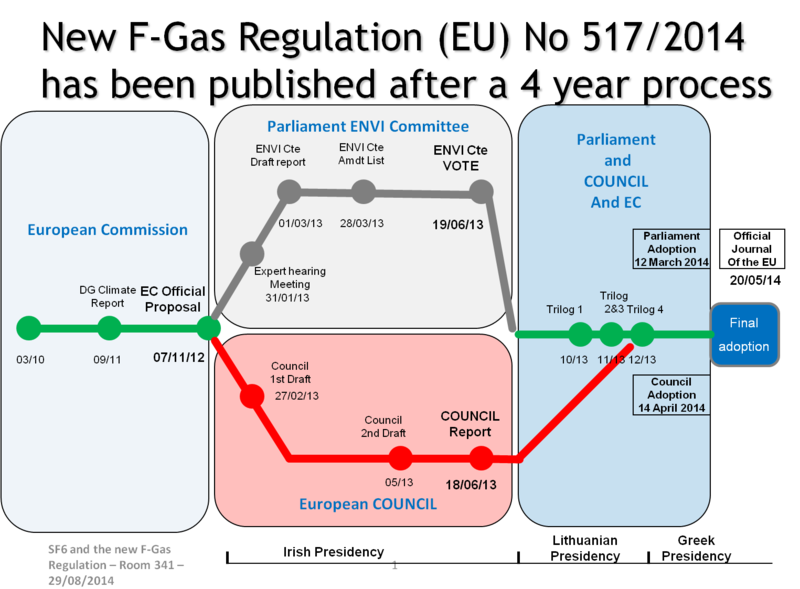 On 9 June 2014 EU F‑Gas Regulation No. 517/2014 came into force. It strengthens measures to contain emissions of fluorinated greenhouse gases: hydrofluorocarbons (HFCs), perfluorocarbons (PFCs) and – what I’d like to talk about – sulphur hexafluoride (SF6). 517/2014 seeks to bring down the EU’s F-gas emissions by two-thirds from 2014 levels by 2030 as part of the ultimate objective of cutting overall GHG emissions by at least 80% by 2050 against 1990 levels. We in the electrical industry can only applaud the environmentally friendly thinking behind the regulation’s more wide-ranging scope. At the same time – and I think I’m speaking for most of us – I believe we can heave a sigh of relief. The new restrictions on the use of SF6 do not affect medium– and high-voltage switchgear. Annex III stipulates phase-out dates for F-gases used in many applications, depending on their global warming potential (GWP). It does not mention SF6 in switchgear. In effect, there are no restrictions. Why has so little changed in No. 517/2014? Work on 517/2014 got underway in 2011, prompted by a report from the European Commission under the provisions of Regulation No. 842/2006, which 517/2014 repeals. The report considered whether tightening and enforcement of F‑gas rules would significantly cut GHG emissions. Its findings triggered four years of work that culminated in 517/2014. Over that time there was some hard talking in the European Parliament and Council. I think some of us in the electricity industry felt the momentum was with banning SF6. The new regulation can dispel any lingering doubts. I think that policy makers realized there was no need for a blanket ban of SF6 because in the last 20 years we’ve put so much work into researching and developing products and methods, making SF6 cleaner and greener, using less of it, and making our switchgear virtually leakproof. So, SF6 in 517/2014 is not to be phased out. That said, the regulation does a have a provision for reviewing the situation in 2020, just like 842/2006 did. The review will, in fact, explore the use of SF6 in medium voltage secondary switchgear. Like I said, there are few changes. But there are some. They seek to further strengthen safeguards against SF6 escaping into the environment. Article 10 requires both switchgear makers and users to train and be certified in all SF6 handling operations from installation to decommissioning. Regulation 842/2006 required certification only for recovering old and unused SF6. Under Article 12 we manufacturers will have to modify the label content on all new equipment that contains fluorinated GHGs before we can place it on the market. As for you operators you have to keep records of the equipment you use that contains SF6, while we have to meet new reporting obligations. Actually, Articles 4 and 5 waive leakage tests and detection systems of switchgear when the SF6 it contains is below a certain or level or if they are pressure- or density-monitored. I think that is a further testimony to the uncompromisingly high standards of safety in the electricity industry and our efforts to control emissions. Although I think a guide to the new regulation would be useful, its thrust is clear. Our use of SF6 in Medium Voltage and High Voltage switchgear is unaffected, while the changes it has introduced achieves the purpose of minimizing emissions by phasing out HFCs and PFCs and, as regards SF6, increasing awareness, safeguards, and professionalism. Want to know more or clarify any points. Please feel free to get in touch.